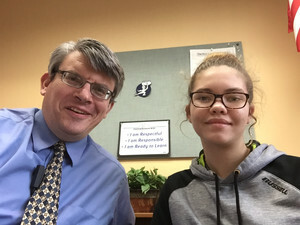 3/21/19 Good News Call is for Diana Gabriel, an 8th grader. When I was in Mr. Parks room today, he pulled me over to the desk to show me some recent Math assignments that Diana had done. He shared his appreciation for how much attention to detail Diana has put into her work all year long, and as I looked through the problems it was easy to see the effort it took to be that meticulous. Mr. Parks wanted me to let her parents know how much he recognizes and values the consistent effort she puts not just getting things done, but doing her work with craftsmanship. Way to go Diana! 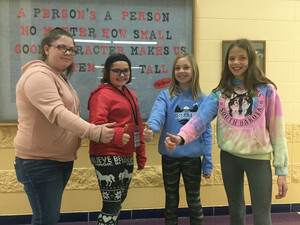 3/8/19 Good News Call comes from Mrs. Johnson, one of our recess supervisors. She had the following to say about Matt Koehler, a fifth grader. Matthew Koehler needs to be told that he is much appreciated when he helps on the playground bringing in equipment that he does not use. He does this continually. A great role model for others to emulate. Not only does Matt have it together character-wise, he also has one of the best smiles at AMS, as you can see in the picture below. We're grateful to have him here. I noticed during indoor recess that Kash Goffin fixed the goal when students had taken it apart. Then later I noticed that he picked up the basketball container when some other students had knocked it over. He quiet often displays responsibility for things that he didn't do. Good guy to have on your team. We so appreciate how Kash leaves our school better than he found it. I agree with Mrs. Johnson and am thrilled to have him on our team! 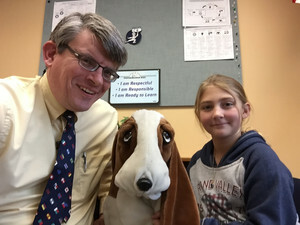 3/5/19 Mrs. Hahn asked me to place a good news call in behalf of Mason Brundidge and Chloe Hohmann, both sixth graders. In Math class today, they introduced a new concept that was a bit challenging, but Mrs. Hahn shared how they both leaned into the challenge and showed "awesome teamwork and on-task behavior. Way to go Mason and Chloe! Abby Smith is all about fun, laughter and friends. And as shocking as this might be, my ELA class doesn't always have that as a focus. So Abby struggled a bit for the first part of the year, but a while ago I started noticing Abby was giving a lot more effort and attention in class. Most noticeable is her much better use of work time and an increase in the quality of her work. A couple of days ago she showed me a piece of writing and said, "Are you proud of me?" I quickly turned that around saying, "What's most important here is that you are proud of yourself. Are you?" She smiled and nodded agreement. That is a stand out moment for her in ELA class this year. Way to go Abby! We love having Abby at AMS and appreciate her drive to keep making herself better. I want Hunter Rosplock to know that his actions spoke volumes about the kind of person he is this week. The message in advisory Wednesday was "We are only as strong as our weakest link. In helping others in our group....our whole group becomes stronger." Then we checked our grades with the expectation of helping others get their work completed and turned in. A student in the group stated he was having trouble in math and that is why his math work was missing. Hunter spoke up and said, "I can help you with that." And he proceeded to make the time to help this student. Thanks Hunter for being a strong link and sharing your talents to help others around you. 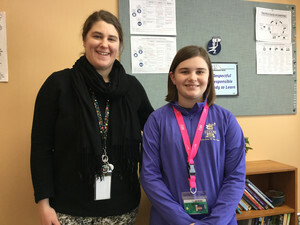 2/22/19 Good News Call - Kristina Peterson was a great help in science class today by helping other students finish their work as well as typing their information into Amplify which is the science curriculum our sixth grade is currently using. Thank you Kristina for being you! 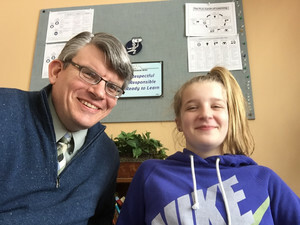 2/20/19 Good News Call was in behalf of Ashlyn Wilcox, a sixth Grader. In Mrs. Wiedmeyer's science class they are learning to use a new program called Amplify to experiment with science and learn interactively. As they are just starting up however, students are still learning how to use the program. Last week Mrs. Wiedmeyer saw Ashlyn helping another student out in working through the problems and typing their responses into the program. We so appreciate Ashlyn being aware of other student's needs and helping us all grow together. 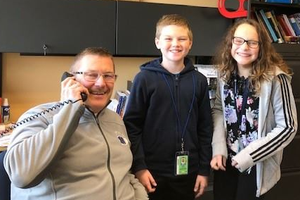 Mrs. Wiedmeyer not only recommended the call but was able to join Ashlyn and me as we called Ashlyn's dad Way to go Ashlyn! On Friday, Brandon won the school-wide 6th - 8th grade Geography Bee!! 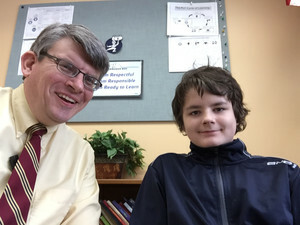 Earlier in the day during STAR Math testing, Brandon was telling Mrs. Hahn he had the Geography Bee & wanted to make sure Mrs. Krueger knew that he wasn't going to be in study hall, so he was being responsible. Just before the Geography Bee was to start, Brandon was in the hallway putting his binder away. He saw a 6th grader wandering down the hallway & asked him if he was looking for the Geography Bee. Mrs. Hahn overheard Brandon tell this 6th grader that he could follow him & he would show him where to go, so he was being respectful. Of course he was demonstrating academic excellence or being ready to learn by winning it! Ms. Gaffney said "His smile was so big when he won!" She is so proud of him!! Brandon's great work on Friday wasn't just doing well at the Geography Bee, but at doing all the little things that helped people around him. Way to go! 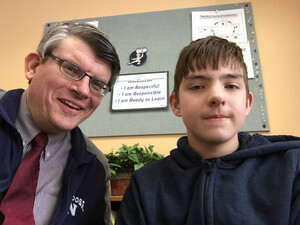 1/18/19 Good News Call is in behalf of Andrew Beadell, a 7th Grader. Mrs. Beggs recently asked her classes to reflect on a quote by George Orwell and was very impressed by the very thoughtful response Andrew provided. Mrs. Beggs shared that "[Andrew's response] shows the level of critical thinking needed in today's world as a young person. I'm so pleased to see it and proud of Andrew for taking the time to show his thinking." Thanks for putting yourself into your work Andrew! You never know how that will impact other people. 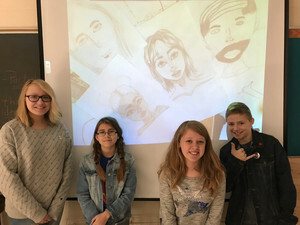 I would like to acknowledge the contributions of four students who volunteered to help team teach a unit on drawing realistic portraits in our 7th grade Art class. I couldn’t have been more impressed and proud as I watched each of the them bravely walk up to the document camera to project their drawing and give students instructions, helpful tips, and guidelines to drawing different facial features in a realistic way. The respectful conversation and the diverse practice drawings that emerged at the end of the class period were most impressive. Thank you Aliyah Perez, Hailee Straight, Gannon Hahner, and Adriana Rohan! Teaching becomes electric when students drive it, and we appreciate Aliya, Hailee, Gannon and Adriana in making that happen. Way to go! 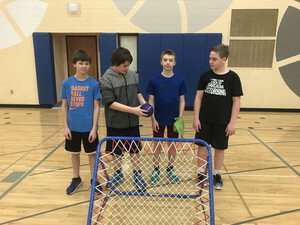 I want to nominate Josh Kelnhofer, Andrew Beadell, London Stascak, and Kyle Mohr for the good news call of the day for their great effort and leadership in PE. We we have been learning a new game called Tchouk (Chook) ball and they have been great players and teammates for the rest of the class. Excellent effort boys! 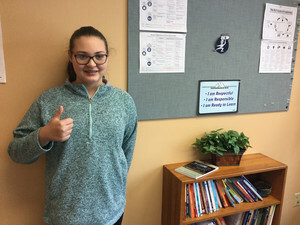 I'd like to nominate 8th grader Amara Merten for the Good News Call. 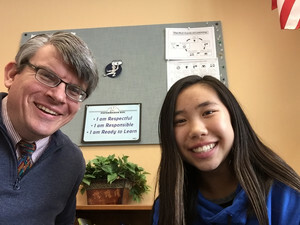 I have been very impressed with her in math class this year. She behaves like a model student. She comes to class with her assignment done & is prepared to learn by having the appropriate materials. She asks questions when she doesn't understand, she volunteers answers, has a very organized think book, and is a great CPM team member. Her qualities as a team member is what sticks out to me the most. When one of her teammates doesn't understand what to do, she is very patient with explaining to them how to do the problem(s), not just giving them the answer. If one of her teammates gets called on in class & they don't know the answer, she has their back. I have not seen any conflict with Amara & her peers in class. She is an amazing CPM team member & I often wish I could have an Amara in every team! 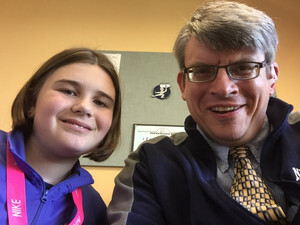 1/3/19 good news call of the day is in behalf of Alicean Van Straten, a sixth grader. Right before our recent break there was another student in Alicean's art class that was having a difficult day. 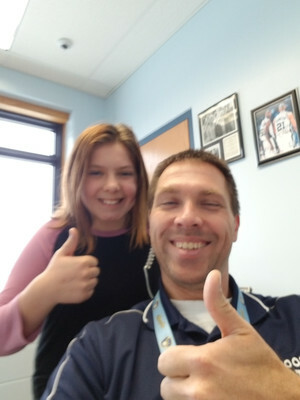 Mrs. Johnson shared with me how impressed she was that Alicean went out of her way to work with that student without being asked and just helped him be successful. Thank you Alicean for providing the little acts of kindness that make such a difference! 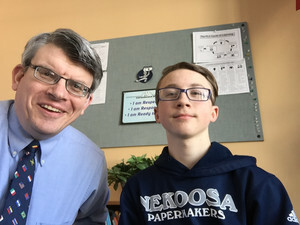 1/3/19 good news call is in behalf of Jeremiah Dye, a seventh grader. Mrs. Beggs shared how much she appreciates how Jeremiah is always respectful, working hard and giving his best every day. She feels that Jeremiah's focuses on these little things on a daily basis is the reason he is so successful as a student. I appreciate how much Jeremiah can work with anybody and provides understated leadership by leading through example. Way to go Jeremiah! Congratulations to Addy Conley for showing such wonderful growth as a reader. 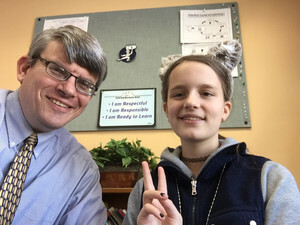 Last week, she took a STAR reading test, and has grown 1.0 (one full year) since school began in September. I asked Addy why she thinks her reading scores went up so much. She replied that she basically is reading all of the time, so it's no surprise to her that she's gotten better at it. Way to go Addy! It was a hectic day in the first two sixth grade math classes. 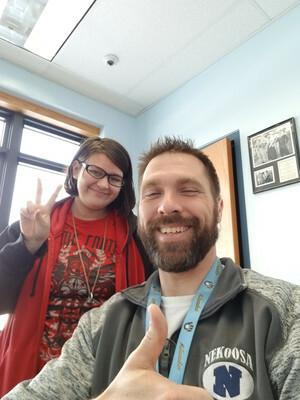 At the beginning of the third period, after the assignment notebooks were filled out and assignments were checked, Isabella Williams asled Mr. Baumgart if she could hand out the teamwork for the day's lesson. Exactly what the teacher needed at the time. Upon completion of the handing out of the teamwork, Bella asked if there was anything else she could do for the teacher. Exactly what Mr. Baumgart needed at the time. Thanks for seeing a need and jumping in Isabella! You never know what others need until you get involved. This week, I had writing conferences with students concerning their summary writing. 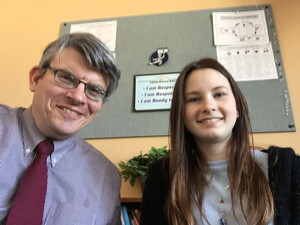 Autumn Brostowitz took the information from the conference and worked to make her writing better. Thank you for your wanting to do your best! I would add, not only is Autumn great at pushing herself to succeed, but she does it with an infectious smile as well. Way to go Autumn! 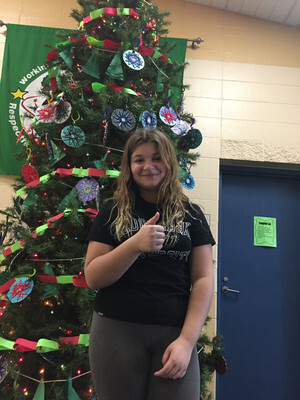 Good News Call 11/30/18 Mrs. Krueger wrote: When A.J. was in the hallway a bunch of his papers fell out all over the floor. Daisha Storlie stopped and helped A.J. pick up his papers and hand them to him nicely even though she was running late to class she still stopped to help A. J. Thank you Daisha for making a positive difference here at AMS! You are appreciated. 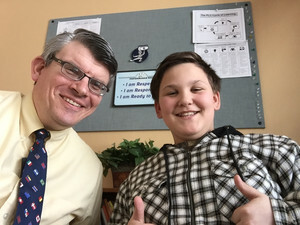 11/28/19 Mrs. Wiedmeyer writes: We got a new student on Monday, Ryan Mohr, who is quite outgoing and eager to make friends. During Social Studies class the students were allowed to work in partners. Our new student asked Hailey Passineau to be his partner. She cheerfully said yes. I know some of Hailey's best friends are in this class, but she choose not to work with the new student when asked. Hailey is open to and friendly with all her classmates. She is a friend to everyone! 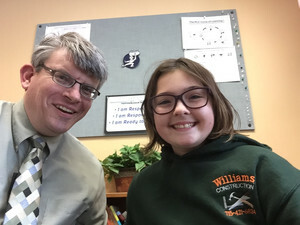 Ariana Rosplock goes above and beyond in her learning even when it is difficult for her. She really strives to understand strategies and to practice them in reading and writing. When it comes to working with a partner, she will work with anyone and help them to put forth their best effort. When things get difficult when working with a partner, she tries her best to resolve the situation in a positive manner. She is a very forgiving person. We are so grateful for the so many students like Ariana who do the little things to lift up the people around them. Way to go Ariana! 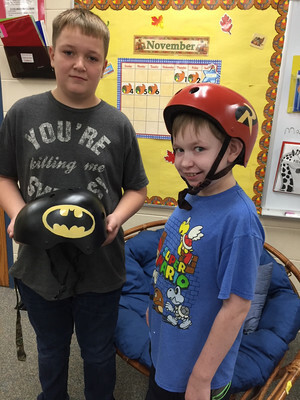 Bergen Mlodzik took on the challenge of creating Batman and Robin helmets for the Adaptive Physical Education class. His hard work and talent put a smile on Luke’s face, creating a heartwarming surprise for this young Robin fan. 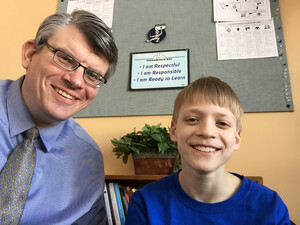 Luke is looking forward to teaming up with His teacher, Mr. Thomas, who will soon be referred to as Batman! Thank you Bergen for putting your time and talent into serving others here at AMS! Thanks for upping the count of superheroes here at AMS Bergen. Even though you don't wear a cape (or a helmet as the case may be) you certainly are one of them! McKena's initiative to fix things and make it better for others is so refreshing. A 7th grade student caused damage to school property, the cushion on the reading couch in room 700. McKena brought in yarn and used her sewing skills to fix the cushion just because she saw the need to help out. Thank you for your act of kindness. A huge shout out to McKena for leaving Mrs. Beggs' room better than she found it. Mrs. Beggs uses a number of sofas, recliners and other soft chairs to help students have a positive experience while reading. McKena's service makes that all the more easier. 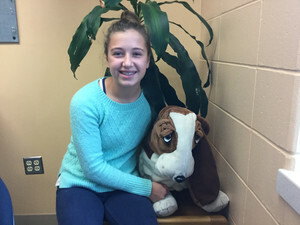 Alaina Kawleski has been a great leader and peer mentor to another student during P.E. 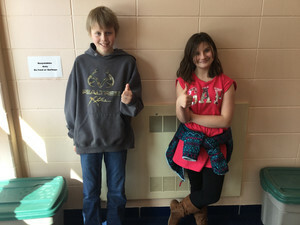 She has helped the other student with his warm-up plan and has gone out of her way to assist him during P.E. She has shown all aspects of C.A.R.E.S. and her efforts are appreciated! Thank you for helping out with the little things Alaina! That is the core of true leadership. Shout out to Kate Kniprath, Isabella Williams, Hallie Anderson and Laura Koehler. These girls organized and presented a "Get Well" poster to a special needs student in Mrs. Copeland's class. 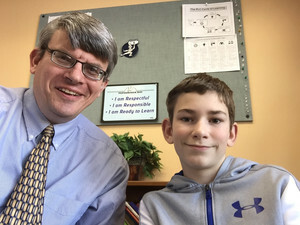 Nathan had surgery in early October and returned to school last week. The messages on the poster indicated that their art class (which Nathan is part of) missed him and wished him well in his recovery. These girls exhibited compassion, caring, and kindness when presenting this poster to Nathan. It brightened his day!! We appreciate Kate, Isabella, Hallie and Laura making AMS such a welcoming place. Keep up the good work! Kendall and I called her mom, who was thrilled to hear the news but not surprised at her thoughtfulness. Kendall preferred not to have her photo taken today, so we'll let Terry's letter paint the picture for you instead. We appreciate Kendall's ability to lift those around her and brighten someone's day! Ashlyn is very responsible and helpful in advisory. She takes great pride in doing the right thing and encourages others to do the same. Ashlyn is eager to learn and contribute to discussions in art . She impresses me with her level of interest and knowledge on topics discussed in class. I always know that I can count on Ashlyn when a need arises! I am so grateful to have her in both art class and advisory! Thanks for your enthusiasm Ashlyn! I want to give a huge shout out to Matt Koehler. After leaving the gym from our indoor recess, he carried out a huge armful of forgotten clothes. As we were taking a restroom break, instead of just dumping this armload into the baskets of the lost and found, he proceeded to hang every item up. Matt then began hanging up the random items that had been previously tossed in the basket. Small acts (usually go unnoticed) such as this are what help make our school great! Thanks for taking the initiative to make our school a better place Matt! Noah Gaupp is a delightful young man who is polite, thoughtful, and creative. You can often find Noah making the smallest cranes imaginable for others when he finishes his art projects early. Last week he offered to make balloon animals for all of his classmates. Noah is an absolute joy to have in class! It was fun last week seeing so many students carrying balloon animals around the school. Thanks for making AMS more colorful Noah! 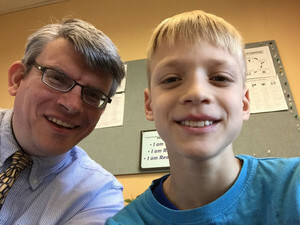 10/16/18 Good News Call is in behalf of Kaleb Lochner, a 4th Grader. 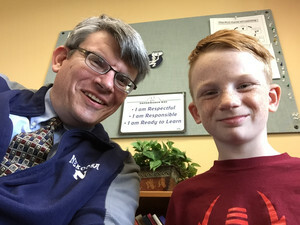 Mr. Olson is one of our recess supervisors and he shared how Kaleb will take time at the end of recess to gather balls that have rolled away or that other students didn't put away. 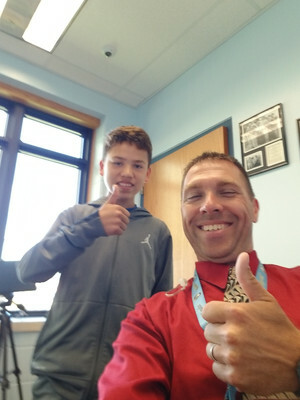 Normally Mr. Olson and Mrs. Johnson have to take some time to do this because students forget, but Kaleb has gone out of his way to help them out. Thanks for making AMS a caring place Kaleb! 9/27/18 Good News Call. At recess, Aric was a voice of reason when students were having a dispute. He showed maturity and self control to help a situation. Thanks Aric for being a positive influence out at recess.